It's your turn! As your job interview comes to a close, one of the final questions you may be asked is, "What can I answer for you?" or "Do you have any questions for me?" Your interviewer will expect you to have some inquiries. Not asking any questions could make you seem unprepared or disinterested, so take the time to have some questions of your own ready to ask the hiring manager. Asking questions can also give you the opportunity to further highlight some of your qualities, skills, and experience, and show the employer why you're a terrific match for the job. Responding with very specific questions will allow you to impress your potential employer with your knowledge and interest in the industry while also determining if this is the right job for you. Plan ahead and have interview questions of your own ready to ask. You aren't simply trying to get this job - you are also interviewing the employer to assess whether this company and the position are a good fit for you. Asking questions is a great way to dig into the company culture and the specific day-to-day responsibilities of the job so that, should you be hired, your first week or so in the position won't be accompanied by any major surprises. You, of course, don't have to ask every question on the list, but having a few good questions ready will help you look like an informed and prepared candidate for the job. Here's a list of suggested questions to ask the interviewer so you can ensure the company is a good match for your qualifications and interests. What is the company's management style? Who does this position report to? If I am offered the position, can I meet him or her before making my final acceptance decision? Are there any examples of a career path beginning with this position? What can I clarify for you about my qualifications? Do you have any reservations about my qualifications? What's the most important thing I should accomplish in the first ninety days? How would you describe this company's values? What are the company's plans for growth and development? What's your least favorite part of working here? "Me" questions are those that put yourself ahead of the employer. These include questions about salary, health insurance, vacation time, work hours per week, and other concessions. During an interview, you are trying to demonstrate to the employer how you can benefit the company, not the other way around. Once you are offered a position, you can begin to ask what the company can do for you. Avoid multi-part questions; they will only overwhelm the employer. Each question should have one specific point. Most questions with a "yes," "no," or another one-word answer could likely be answered by searching the company's website. Instead, stick to questions that will create a dialogue between yourself and the employer. Avoid asking questions about just one subject. For example, if you only ask questions about your manager and his managerial style, the interviewer may assume you have an issue with authority figures. Ask questions about a variety of topics to demonstrate your curiosity and interest in all aspects of the position. While it is a good idea to try to establish a rapport with your interviewer, do not ask personal questions that are not public information. For example, if you see a college banner on the employer's wall, you can certainly ask if he went to that college. However, avoid overly personal questions about the interviewer's family, race, gender, etc. There are some questions that you should avoid asking since they won't present you in a positive light. Depending on the type of job for which you're interviewing, there are specific questions you may want to ask your interviewer. In addition to preparing a list of questions to ask the hiring manager, it's also important to review the most common interview questions you'll likely be asked so you can think about how you will answer. 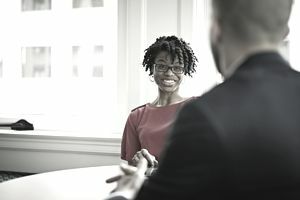 There are some interview questions, typically known as illegal interview questions, that employers should not ask during a job interview. Asking about your race, age, or any disability are some examples of questions that are illegal for potential employers to ask you.